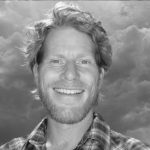 Brad Lancaster has taught, designed, and consulted on regenerative-design systems of permaculture and integrated water-harvesting systems in seven countries since 1993. He created and lives on a thriving solar-powered 1/8th-acre urban oasis in downtown Tucson, Arizona, which harvests 100,000 gallons of rainwater a year where just 12 inches falls from the sky. Brad’s dynamic books, talks, workshops, and living example have inspired tens of thousands of people to ‘plant the rain’ to sustainably grow their local resources. Visit his website at HarvestingRainwater.com.